Of Rs 469.89 crore in donations above Rs 20,000 in 2017-18, BJP got Rs 437.04 crore and the remaining six managed a mere Rs 32.83 crore. New Delhi: The Bharatiya Janata Party (BJP) has received over 13 times the donations, of above Rs 20,000, as compared to the next six national parties put together, states a report by the Association of Democratic Reforms (ADR) released Wednesday. 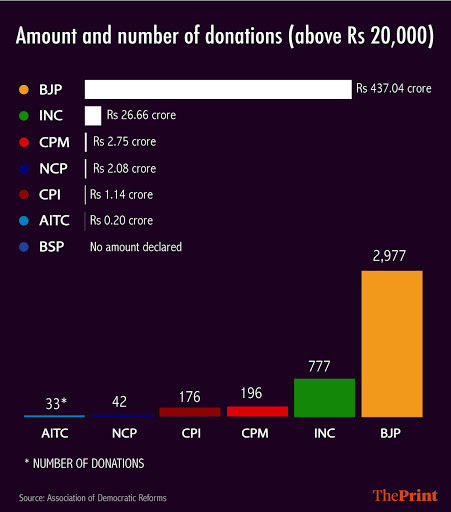 According to the report, seven national parties — the BJP, Congress, Bahujan Samaj Party (BSP), Nationalist Congress Party (NCP), Communist Party of India (CPI), Communist Party of India-Marxist (CPI-M) and the All India Trinamool Congress (AITC) — received donations, above Rs 20,000, totalling Rs 469.89 crore in the 2017-18 fiscal year. Of this, the BJP received Rs 437.04 crore from 2,977 donations, while the Congress is a distant second at Rs 26.66 crore from 777 donations. The ADR report states that the CPI(M) received Rs 2.75 crore, the NCP received Rs 2.08 crore, the CPI had Rs 1.14 crore and the AITC secured Rs 0.2 crore (Rs 20 lakh). The BSP, in keeping with a 12-year-old trend, has declared that it did not receive a single donation exceeding Rs 20,000 (see graph). “The total amount of donations received above Rs 20,000 by the National Political Parties during FY 2017-18 is calculated from the donations report submitted to the Election Commission annually,” the ADR report states. According to the report, the BJP and the Congress received their largest share of donations from Prudent Electoral Trust in the financial year 2017-18. The trust raises money from the industry for political contributions. According to this report, DLF was the biggest donor to the trust in 2017-18 fiscal with Rs 52 crore, followed by Bharti Group (Rs 33 crore) and Shroff Group’s UPL (Rs 22 crore). The report, however, states that there has been a 20 per cent overall decrease in donations from the 2016-17 fiscal. The BJP recorded a decrease of 18 per cent, while donations to the Congress dipped by a staggering 36 per cent. The report states that the BJP collected maximum donations in October 2017 while the Congress bagged its maximum donations in November. The report notes that there has been an incomplete disclosure of information and “ambiguity in details of donations” received by national parties. “Of the seven national parties, four — BJP, INC, CPI and CPM — had not declared PAN details of 219 donations through which the parties collected a total of Rs 4.95 crore,” says the report. 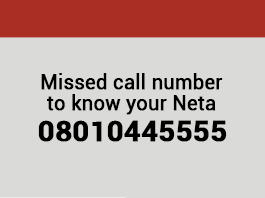 In a number of cases, PAN details were also missing in the information provided to the Election Commission. ADR has called for parties to ensure that no part of form 24A, which declares details of donors providing over Rs 20,000, is left blank. The report also suggests that the details of donors should be made available for public scrutiny under the Right to Information Act. “The national and regional parties should, ideally, lead by example by filing complete and correct statements of donations to the ECI well in time for public scrutiny so as to encourage financial transparency,” the report recommends.